Following in the stead of Snarkitecture and Bjarke Ingels, New York's James Corner Field Operations will create the National Building Museum's summer 2016 installation. The landscape architecture firm is best known for its outdoor projects such as the High Line, Santa Monica’s Tongva Park and Ken Genser Square, Race Street Pier in Philadelphia, and Seattle’s Central Waterfront. Field Operations will likely bring a fresh perspective inside the building's four-story Grand Hall. The National Building Museum opened in 1985 in the Pension Bureau building, originally built in 1887 and designed by Montgomery C. Meigs, the U.S. Army quartermaster general during the Civil War. Notably, the Italian Renaissance–style building features 75-foot-tall Corinthian columns in the Grand Hall and a 28-panel frieze by American sculptor Caspar Buberl. A design will be revealed in the spring and the exhibition will run in tandem with the museum's summer block party series. “We are very excited about this opportunity to once again transform the Great Hall for summer spectacle and pleasure,” said James Corner, founder of James Corner Field Operations, in a press release. “It will be a great challenge to surpass the genius of previous installations, but also an opportunity to explore something new and unexpected.” Snarkitecture opted for a giant, monochromatic ball pit (Click to see AN's report on this installation) in 2015 and the year before, Bjarke Ingels took advantage of the hall's height to craft a giant maze (Read more about the maze here). Stay tuned to learn what Field Operations creates for the space. To learn more about Field Operations and its projects, check out the Miami Underline and Great Falls State Park. 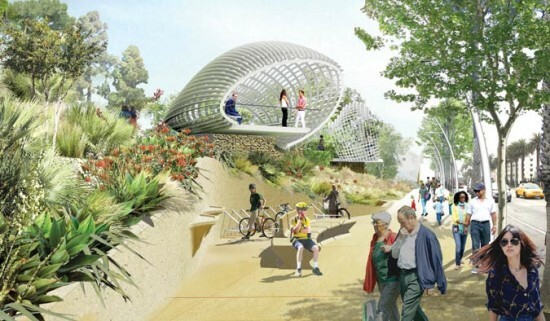 Tongva Park by James Corner Field Operations. His complaint is part of an ongoing crisis in architecture that has divided the discipline. In one camp is a group of architects who work to build new forms, many of whom are divorced from a particular social or political agenda. Often, advanced technology is involved, though it is not mandatory. In the other camp, a group is far less concerned with form-making, and more with attempting to make the world better through design and architecture-related thinking and practice. What has emerged, perhaps as a result of the fallout of the 2008 economic crisis, is a more expanded field of architectural thought, propelled by progressive urban politics and a hope that architecture can still make an impact in the world. These projects often eschew traditional notions of building altogether, looking to activism and conceptual art as fertile productive territory. Of course, architecture is at its best when it encompasses both lines of thought—beautiful, inspiring solutions to relevant, urgent problems. But recently, architects seem to struggle to reconcile these differences. In the realm of landscape architecture, however, these ambitions seem to be in harmony more than ever. Landscapes are no longer simply beautiful complements to buildings or vague public social spaces. Designers and clients are activating landscape design to operate environmentally as flood barriers and water remediation zones, among other goals. Rebuild by Design harnessed this potential after Hurricane Sandy, and hopefully the proposals will come to fruition, as they are currently being moved forward by their respective governments now that HUD has stepped aside. 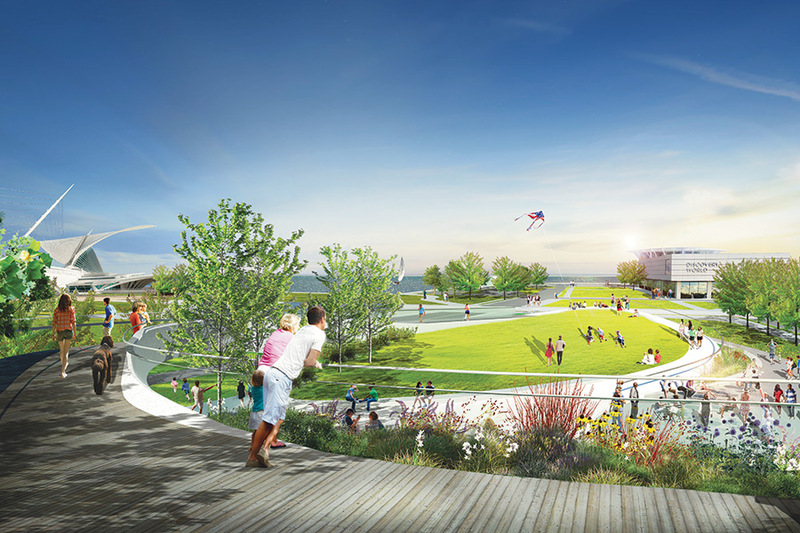 Landscape architects are also tasked with operating socially to create new public spaces, connect previously separated neighborhoods, and reclaim underused land in and around infrastructure, often in synch with other rebuilding and recovery efforts, such as waterfront development or neighborhood revitalization. In our landscape feature, we profile some of the ways landscape plays out as a political agent in Detroit, where artists, activists, and farmers are using ecological planning and landscape design to create a new kind of urbanism—one that provides green space and fresh food while promising a better city for future generations. 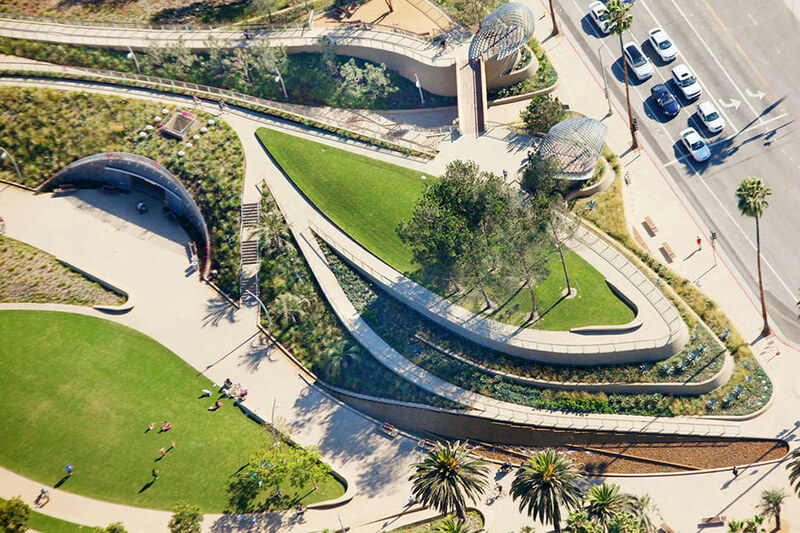 While landscapes are growing in size and scale, technology is being implemented successfully to plan and execute bold new landscape forms, such as the green swoops and concrete curves of Brooklyn Bridge Park and the High Line. Landscape architecture incorporates Rhino, Grasshopper, and even Arduino and advanced robotics, to give new life to green social spaces across the country. Invivia, a team from Cambridge, MA, was recently selected to build 99 White Balloons at Circle Acres Nature Preserve in Austin, Texas. The project utilizes movement sensors to activate the installation when people are nearby and a series of weather sensors to illuminate the installation according to temperature changes. Technology is implemented on the front end of design, too. The Trust for Public Land’s Climate Smart Cities initiative, for example, aggregates layers of GIS data to make it easier for cities and designers to use in a graphic interface. The data allows users pinpoint the sites that will best match their ambitions for the city. In the other half of our landscape feature, we look at socially activated projects that marry design and urban politics by engaging the public through visual software and presentation. As landscape design becomes more relevant and powerful in the urban sphere, perhaps architecture could learn a thing or two about how to get along? Take note. The Seattle waterfront plan is getting a lot of competition. Last month, we saw an opposing proposal to the James Corner Field Operations plan rejected by city council and put on the ballot for next summer. The project—Initiative 123—calls for reinforcing a portion of the Alaska Way Viaduct that runs north-south along the western edge of Seattle as well as building a new section. These two pieces would create a mile-long, High Line–style park. Now a Seattle- and Idaho-based firm, Patano Studio Architecture, is proposing an $800 million project to the east as part of a larger conceptual plan to expand the Washington State Convention Center. 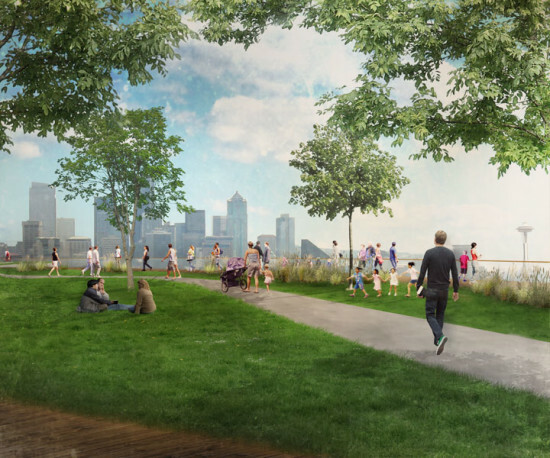 The project would cap Interstate 5—a highway that runs through multiple neighborhoods such as downtown Seattle, South Lake Union, and Capitol Hill—and build a park on top. The architects describe the highway built in 1962 as a "savage scar of roadway" that forever divided the city. Their project would cap a 2 mile long section of the the highway running from Lakeview in the north, south to downtown. 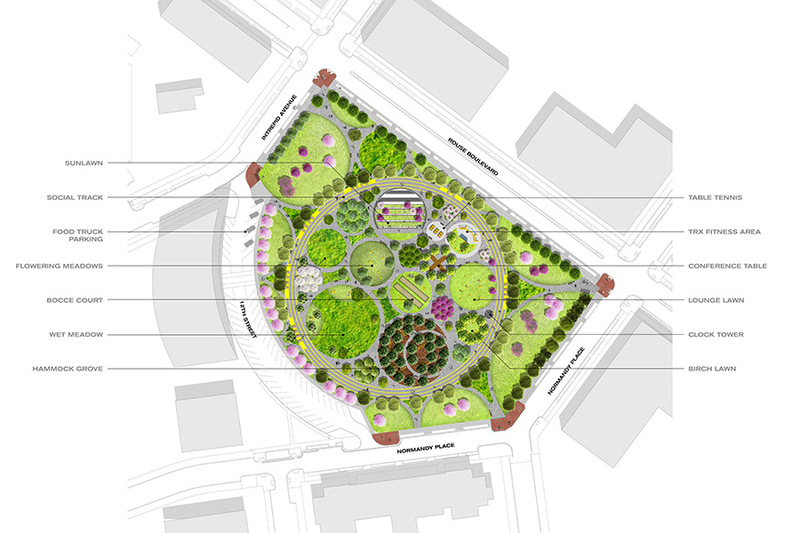 The resulting 45 acre park would feature plants, trails, and community spaces, and be adjacent to affordable housing. 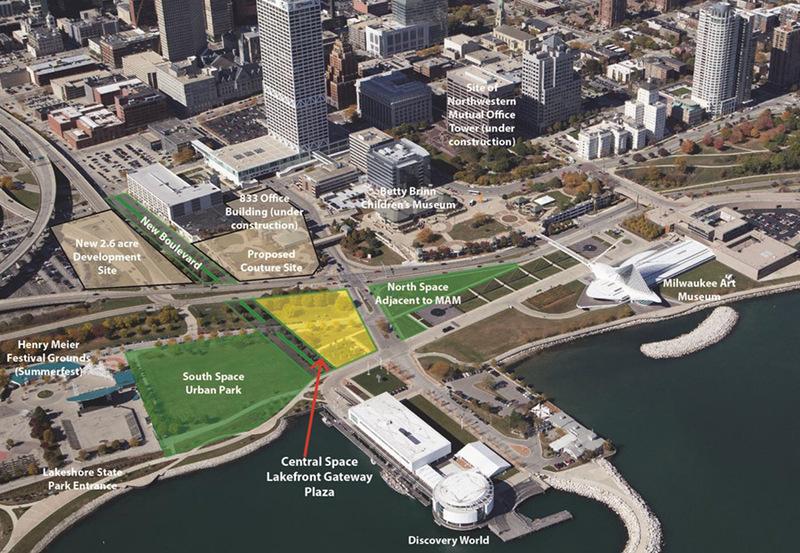 Toward the downtown end, the park would run over a proposed 20,000 seat NBA / NHL arena that would also double as additional customizable convention space for the Convention Center. The arena would be an alternative to Chris Hansen's proposed NBA / NHL arena in SoDo. The concept, if accepted, could take about 5 years to build. "In our mind, the old guard way of thinking and planning the city is one project at a time," Christopher Patano told the Seattle P-I. "I think what we're finding is this one-piece-at-a-time approach is not producing a cohesive result. 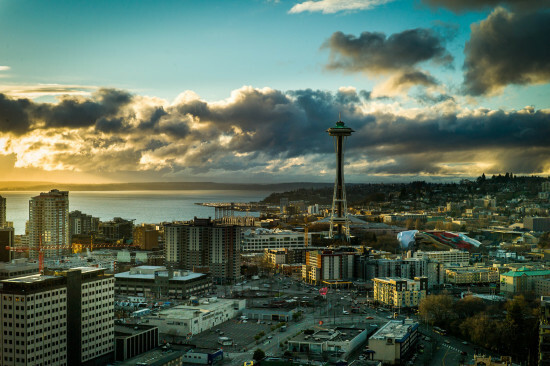 It's not producing a city that functions the way the people of Seattle want it to function." “You can’t rehearse what you ain’t invented,” said Frank Gehry in an interview in this month’s issue, offering up his favorite quotation from jazz musician Wayne Shorter. For L.A.’s most famous architect, the line speaks to improvisation, invention, and the vast possibilities of art and architecture. Vernacular in its delivery, it recalls Gehry’s early experiments with everyday materials. But so much for unrehearsed; he’s quoted it before—most recently to critic Oliver Wainwright when speaking about the Foundation Louis Vuitton, a project as couture as its client. For me, the reference seems historical in its belief in future creations, reminiscent of a time when experimentation was the height of culture. As a native Californian, I take pride in the fact that the West Coast’s history is interlocked with its identity being on the leading edge of architecture, technology, environment, politics, and entertainment. But right now the biggest architectural goings-on are backward looking: Gehry’s retrospective at LACMA, the consolidation of Eli and Edythe Broad’s collection, and the L.A. Olympic redux. Even this summer’s blockbuster Straight Outta Compton is about looking in the rear-view mirror. Or, perhaps looking behind is a nervous condition, a kind of conservative reflex brought on by the economic downturn from which the profession (knock on wood) is finally recovering. Architecture by its very nature is speculative. And experimentation, of course, comes with risk. Risk is not something politicians and investors particularly like. 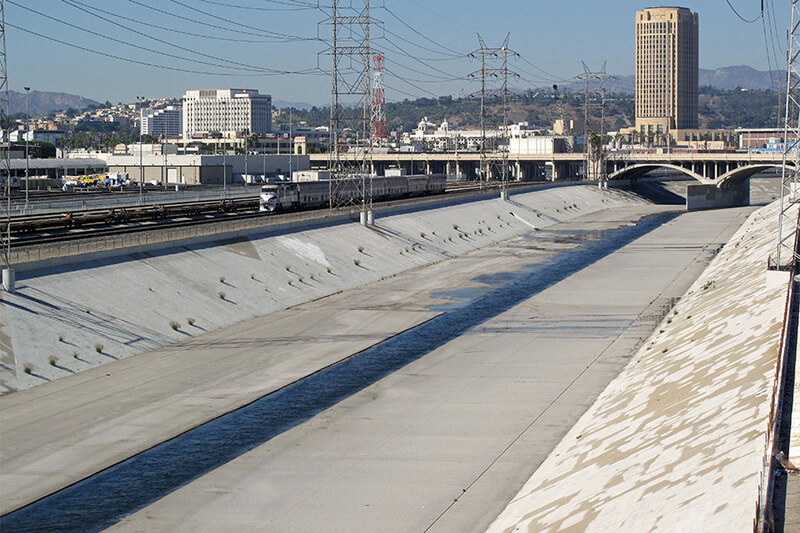 Take the L.A. River, for example: According to Gehry, the Los Angeles Mayor’s Office approached him to transform the channel into something akin to The High Line in New York, a project that opened in 2009. While that successful linear park is a beloved example of infrastructural transformation and public-private partnership, it is a lazy precedent. Progressive six years ago, it’s an oft-repeated example suffering from the law of diminishing returns. In Seattle, the city council recently rejected a plan to transform the Alaskan Way Viaduct—a mile-long, six-acre elevated High Line style park near Pike Place Market. 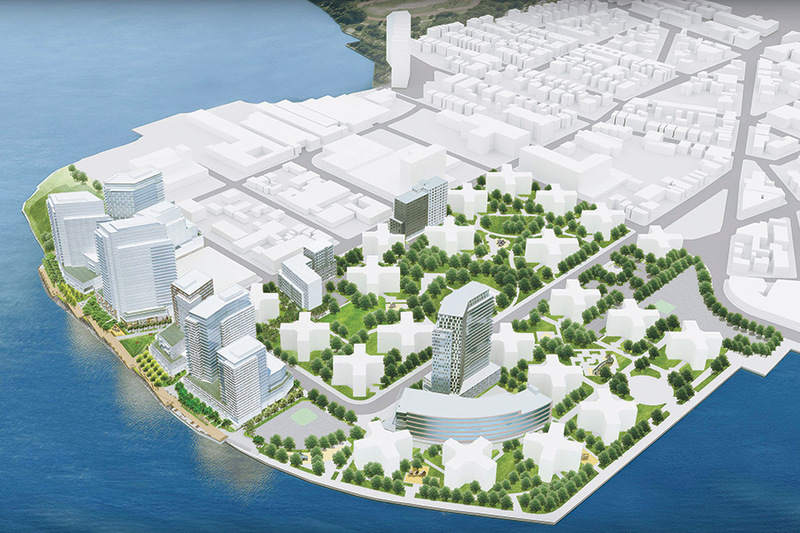 The project, a competing vision to James Corner Field Operations billion-dollar waterfront plan, will go to public vote in 2016. On the flip side, Gehry Partners’ nascent studies on the L.A. River constituencies and hydrology skew toward a technofuturist narrative in which a 3-D model of the waterway and an interactive web platform aim to unify the whole of the L.A. River’s 51 miles. Perhaps activists and stakeholders would be pacified if they only donned a pair of Oculus Rift virtual reality goggles. I’m all for change, and given my Berkeley upbringing, sympathetic to a little mysticism. However, I’m dubious of alchemist claims. Here and now in the Golden State, and throughout the West, ground conditions are at a critical juncture. There is more opportunity for built architectural and urban works than ever in the last decade. At the same time, rapid development is fueling inequity and displacement. While architecture may never be able to solve these issues per se, the discipline operates in this contemporary cultural milieu. Given this context, the built environment (as well as the market) is desperate for design that goes beyond simply an app, a hack, or a computational form. The time for thoughtful experimentation is neither behind us nor in some far off future—Blade Runner was set in 2019—it’s now. A proposal by James Corner Field Operations. 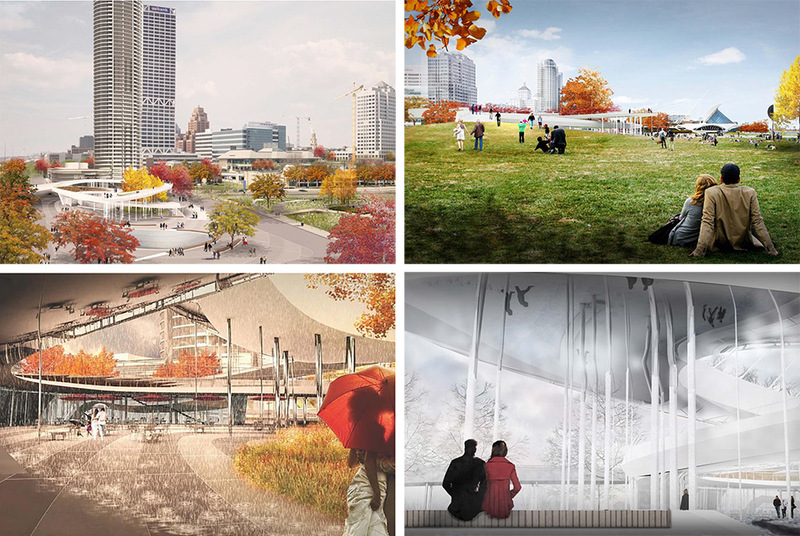 As high-profile developments in downtown Milwaukee creep closer to the city's iconic, Santiago Calatrava–designed art museum, a $30 million design competition aims to unify the two with a new civic space. 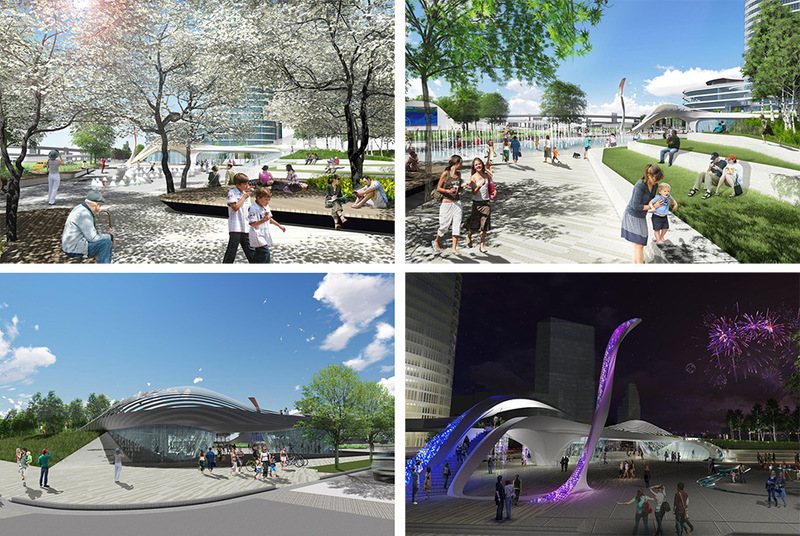 The so-called Lakefront Gateway Plaza project attracted 24 proposals, with four teams emerging as the finalists earlier this year: GRAEF, AECOM, Office of James Burnett, and James Corner Field Operations each lead a group of designers and consultants vying for the job. 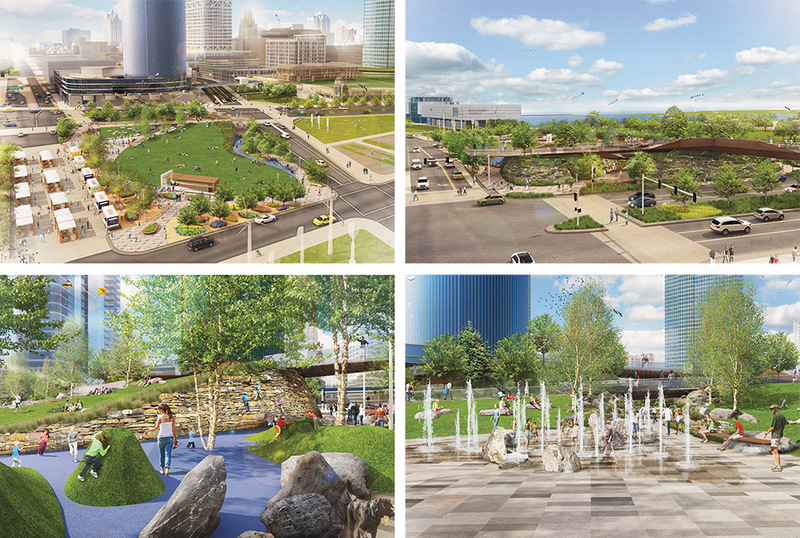 In conceptual renderings recently made public, the design teams presenting visions of serpentine pedestrian bridges, illuminated sculptures, and globular dollops of lush public lawn. Public officials will pick a winner later this year. They are currently soliciting public feedback through community meetings and a website. 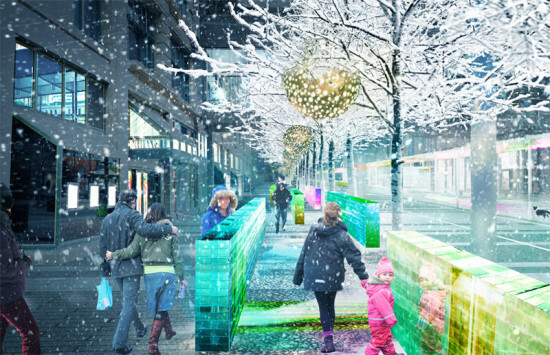 The project is a collaboration between the city of Milwaukee, Milwaukee County, and the state of Wisconsin, but it is seeking private funds for construction (each of the four finalists received a $20,000 stipend from the city to complete their designs). Project briefs asked designers to stay within a budget of $25 million to $35 million, but at publication city officials could not say who would pick up the tab. GRAEF, Milwaukee-based engineering, planning and design firm, has in their corner PFS Studio, Dan Euser Water Architects, Rinka Chung Architecture, and Newaukee. 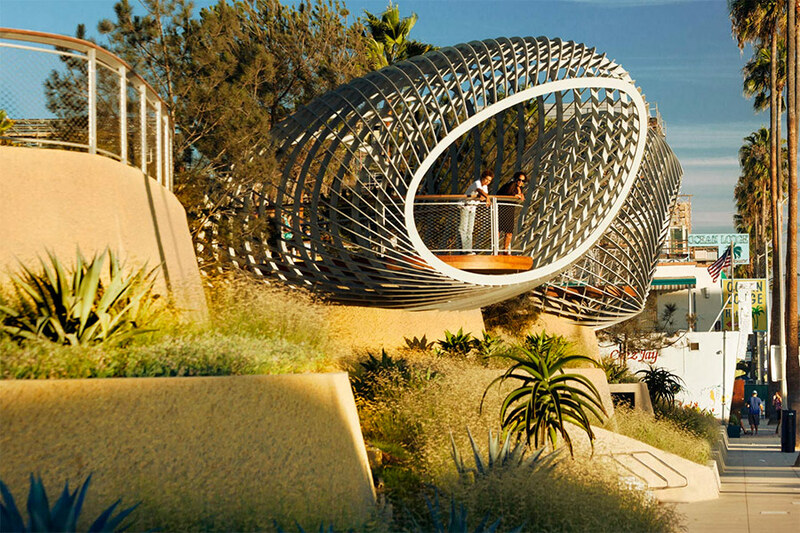 Their proposal frames the 1.5 acre space as an "urban confluence," and tucks a curvilinear pavilion beneath the descent of a wending footbridge lined with tall grass. Towards Lincoln Memorial Drive it presents a sheltered glass facade, while towards Lake Michigan it cradles a water feature and ice rink. A snake-like sculpture lifts off the ground, and is shown glowing purple in one firework-splashed rendering. James Corner Field Operations, most famous for their work on New York City's High Line, leads a team that includes LaDallman Architects, Robert Silman and Associates, Kapur & Associates, Mailu Knode, Dan Euser Water Architecture, HLB Lighting, and Applied Ecological Services. 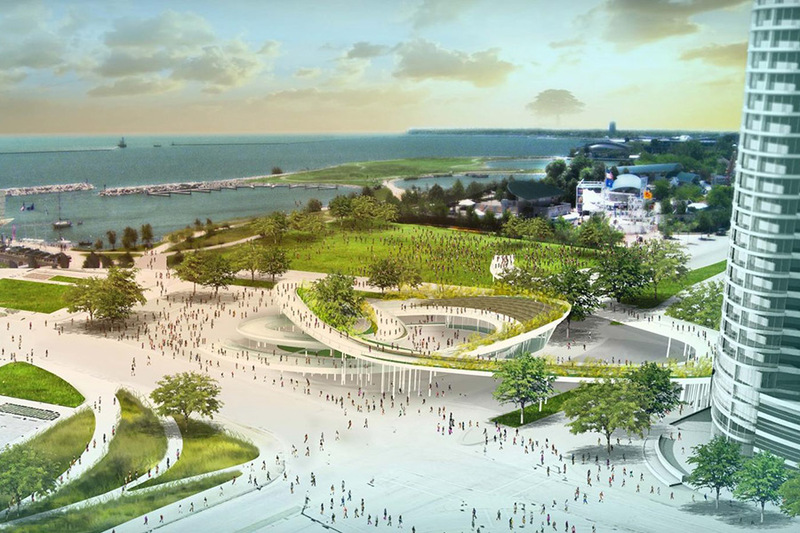 Their plan emphasizes green features such as stormwater retention, and presents a series of spaces in a "procession to the lake." 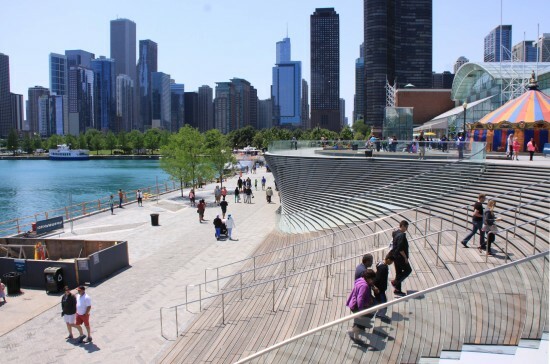 Two oval mounds of green space cleave off the lakefront terminus of the bridge, which gradually meanders toward ground-level after reaching the site. Global design giant AECOM's team is URS, Tillotson Design Associates, Cynthia Reeves, and Delta Fountains. 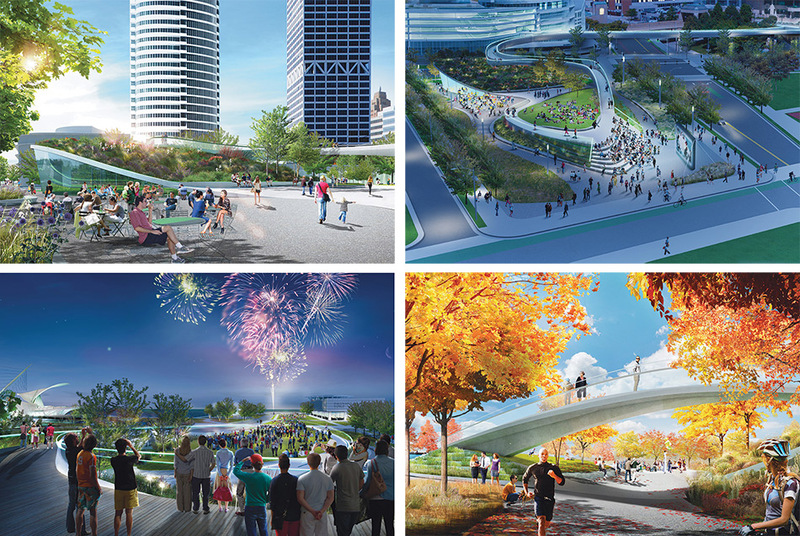 Dubbed “The Hanging Gardens of Milwaukee,” their concept winds its pedestrian bridge over the site, spiraling around landscaped areas and a terraced amphitheater. 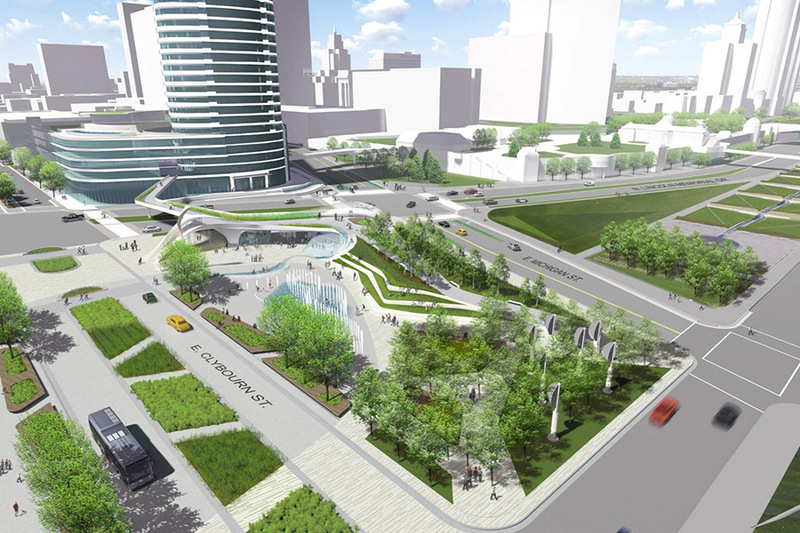 The plaza project is part of a larger infrastructure program that includes improvements to lakefront streets and highways, as well as bike infrastructure and private development. Its planning follows a controversial widening of Lincoln Memorial Drive by Wisconsin's Department of Transportation last year. 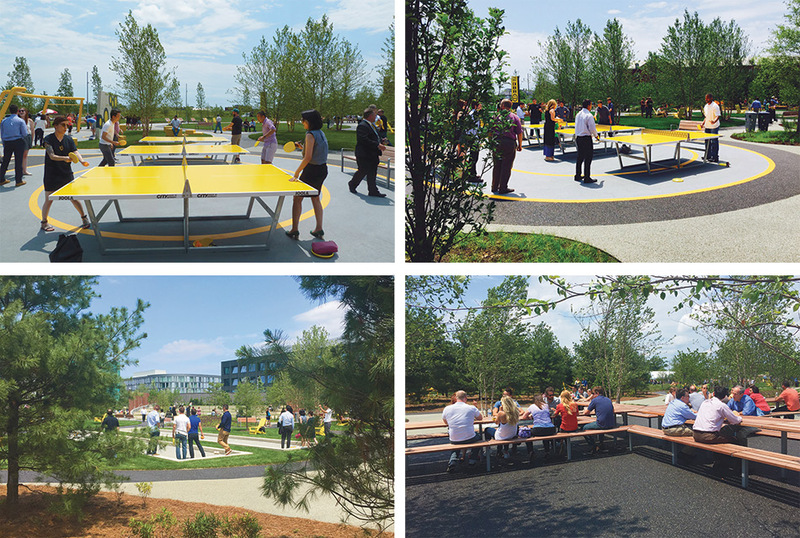 About four-and-a-half miles south of Philadelphia’s Center City, a collection of highly regarded architects are proving that office parks do not have to be soulless and stuffy. 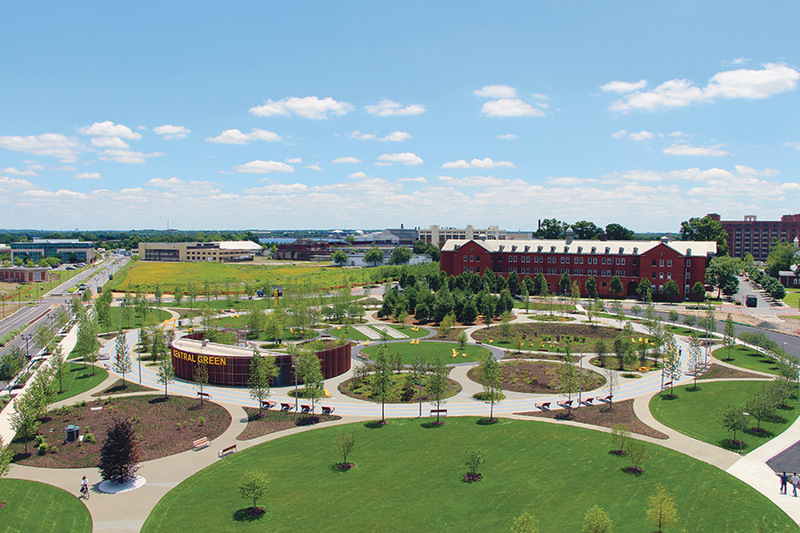 For over a decade, the city’s 1,200-acre Navy Yard has been transitioning into a business campus with a focus on high design, all under the parameters of a master plan drawn up by Robert A.M. Stern. Philly-based firms DIGSAU and Erdy McHenry have already filled in part of that framework with creative buildings wrapped in dynamic facades. Liberty Property Trust also recently unveiled renderings for 1200 Intrepid, a curved office building at the site designed by the Bjarke Ingels Group. Like many of Field Operations’ projects, Central Green has a vibrant mix of landscapes and programming. A gray and yellow running track, dubbed the “social track,” rings the space, forming a recreational band around a collection of smaller circular spaces, each one offering a specific environment or activity. 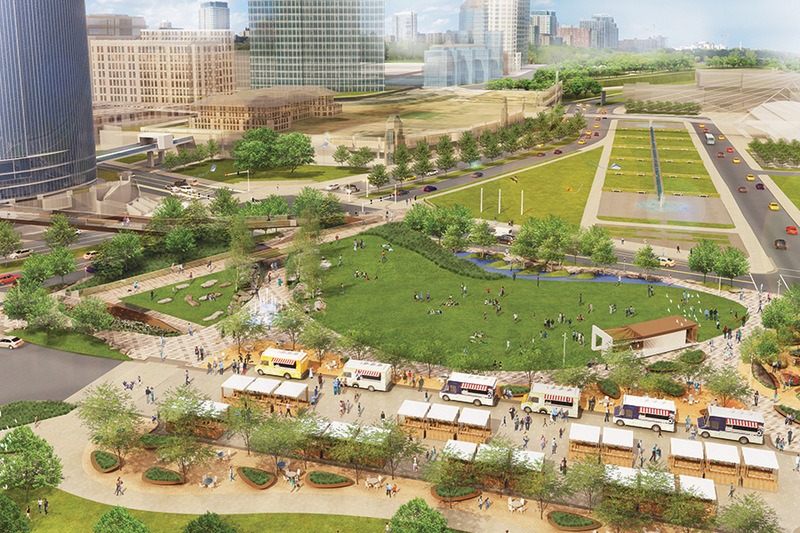 There are lawns, bocce courts, meadows, fitness equipment, a hammock grove, and places for food trucks. Visually connecting the Central Green are pops of yellow, from the café tables to Ping-Pong tables. Astheimer said the vibrant color was repeated throughout the space to give it a strong, iconic identity. Built into the playful space is the “Wet Meadow,” a bio-retention area that collects and treats storm water from Central Green as well as an adjacent street. The area is also surrounded by a series of rain gardens. Field Operations pulled all of these elements together quickly and with a tight budget. Construction of Central Green took only nine months and cost $8.2 million. Infill project at the Astoria Houses in Queens by Studio V.
Near the end of his final term as mayor, Michael Bloomberg unveiled a proposal to shore up the finances of the New York City Housing Authority (NYCHA) by allowing developers to build mostly market-rate apartment towers at eight public housing campuses in Manhattan. While the plan would supposedly generate $50 million-a-year for the cash-strapped agency, it was met with swift and stinging criticism, and a lawsuit from the New York City Council and a coalition of NYCHA residents. Bloomberg’s land lease proposal was further derailed by the politics surrounding it: A billionaire mayor letting developers bulldoze grassy plots and basketball fields at public housing developments for expensive new apartments. One of the most vocal critics of the proposal was Bill de Blasio, the progressive public advocate gunning for Bloomberg’s job. But about a year-and-a-half after becoming New York City’s chief executive, de Blasio has revived the proposal, albeit with some significant changes. For starters, Bloomberg’s 80/20 model (80 percent market-rate, 20 percent affordable) has been switched for 50/50 and 100 percent affordable schemes for new infill buildings. In total, de Blasio said NYCHA infill will create 10,000 new units of affordable housing. These will count toward his larger goal of building 80,000 new units of affordable housing in a decade. 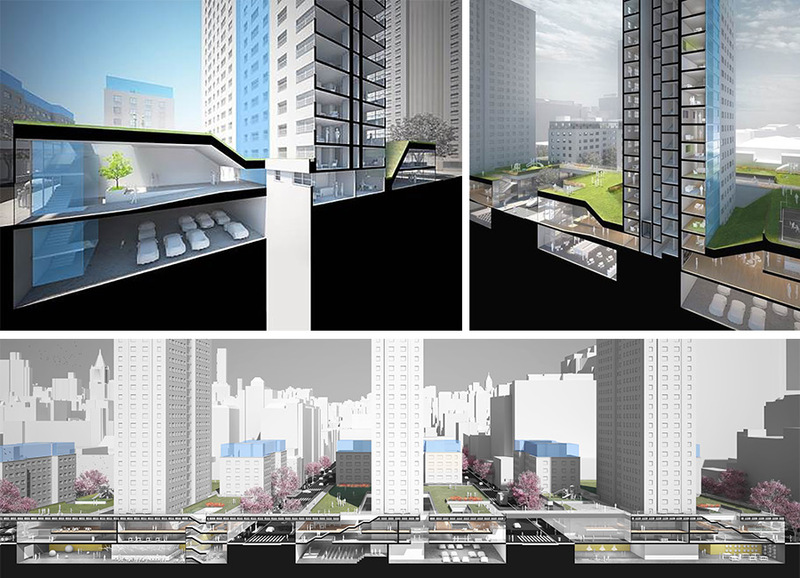 Before and after site plans at Astoria Houses. In early July, the infill process officially got underway with NYCHA releasing an RFP for 100-percent-affordable buildings that are geared toward families and seniors making up to 60 percent of area median income. The buildings, which will comprise about 500 units, are planned for three NYCHA campuses: the Ingersoll Houses and Van Dyke Houses in Brooklyn, and the Mill Brook Houses in the Bronx. At Ingersoll and Mill Brook, new developments will rise on grassy, fenced-in lots; at Van Dyke, new buildings will replace parking lots. NYCHA said it will negotiate with developers over how much revenue these new buildings will generate for the agency. Current NYCHA residents will also get preference for a quarter of these apartments. In August, NYCHA is expected to release an RFP for 50/50 buildings in more expensive markets that would generate between $300 million and $500 million in revenue over 10 years. The RFP for the first three sites comes out of “Community Vision Plans” that NYCHA created in coordination with its residents in an attempt to gauge their housing needs and desires for future development. This type of community outreach was notably absent in Bloomberg’s proposal. NYCHA’s first round of infill development. Left to right: Mill Brook in the Bronx; Ingersoll in Brooklyn; Van Dyke in Brooklyn. But as Bach, and a host of other stakeholders note, if done correctly, infill at NYCHA sites has the potential to deliver more than revenue and affordable apartments—it could lead to new public amenities, better retail, improved streetscapes, and the reknitting of public housing campuses into the larger New York City fabric. Last fall, NYCHA tapped Kohn Pedersen Fox Associates (KPF), which worked alongside ARUP and OLIN, to find ways to achieve these goals while boosting the agency’s sustainability and resiliency measures. Jill Lerner, a principal at KPF, said she was surprised to learn that well over half of the so-called “open space” on NYCHA’s campuses is actually fenced-off or used for parking. “There is a real opportunity to take these big sites that have tremendous amounts of beautiful open space and find a way to organize and improve it for the residents and surrounding communities,” she said. 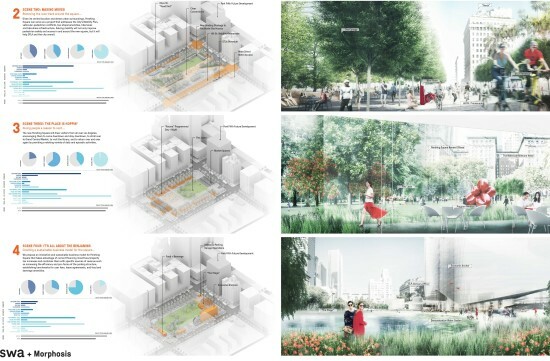 This could include incorporating new landscaping, reorienting pathways, and constructing new buildings on the edges of NYCHA campuses to create dynamic streetwalls with amenities like retail and supermarkets. These are the types of strategies that STUDIO V is incorporating into an upcoming NYCHA infill project at the Astoria Houses in Queens. The firm has designed two buildings that are both 100 percent affordable and will include ground-floor retail or community spaces that face 27th Avenue. This project was approved under the Bloomberg administration as part of the Durst Organization’s Hallets Point mega-development that will transform an adjacent, industrial stretch of waterfront into a mixed-use community and park. 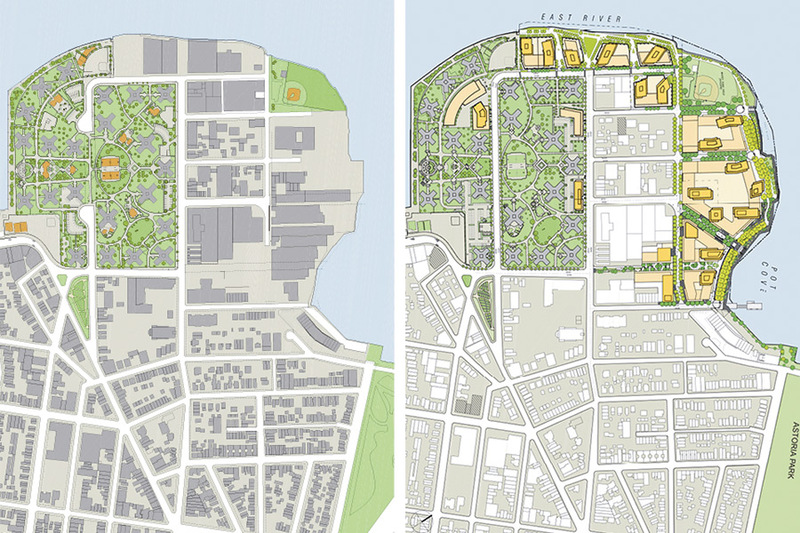 As part of the rezoning, a school will also rise on NYCHA property. The STUDIO V-designed affordable towers are slated to break ground this fall, along with the first phase of the larger development. Proposal for infill at the Fulton Houses in Chelsea. This community-based ethos is imbued in a hypothetical—and highly ambitious—infill strategy proposed for NYCHA’s Robert Fulton Houses in Chelsea by the non-profit Friends of Fulton Houses. The project includes some expected infill moves like street-facing housing towers with ground-floor commercial space, but also presents ideas far beyond what is currently being discussed by developers and planners. For now, NYCHA has a less ambitious architectural vision, only making some fairly broad design suggestions in its RFP like “architectural design should blend, complement, or sensitively contrast with the existing structures and/or salient neighborhood features.” The agency is also encouraging the incorporation of Active Design elements to promote healthy lifestyles at NYCHA campuses. To Bernheimer, pulling this whole thing off will take more than thoughtful architecture. He said that new buildings should not be “dropped like gold teeth into the jaws of NYCHA.” Instead, he explained, successful infill will require input from a range of stakeholders, and planning that considers the day-to-day experiences and needs of NYCHA residents. After all, it was a lack of comprehensive community planning that helped tank Bloomberg’s plan. Now, Mayor de Blasio and NYCHA leadership are pushing forward with their own proposal that is very much shaped by the lessons of the past.